In a Nutshell: Today’s banking customer often is looking for one service provider that can tackle a multitude of needs — and a variety of stages in their lives — without forcing them to jump through hoops. Regions Bank bases its company culture on listening to customers and designing products around those financial needs. The regional bank offers top savings and loan products, as well as four Visa-branded credit cards designed to meet the changing financial needs of its customers. The card options range from low rates and rewards to secured choices that act as a ladder so customers can eventually graduate to a traditional credit card that offers more options. Just as there are no two identical banks, there are no two identical banking customers. Every account holder is at a different stage of their financial journey. While some banks approach credit cards as near utility, others, like Regions Bank, look at them as something that combines customers’ needs for credit with products appropriate for where customers find themselves financially. That diverse menu of services that appeals to everyone is a feat managed by only a few institutions. Regions Bank operates approximately 1,500 banking offices and 2,000 ATMs throughout the US. A member of the S&P 500 Index, and consistently ranked among the top US banks, Regions has approximately $125 billion in assets. Instead, Regions offers a wide array of products and solutions for all of its customers. The company believes in providing options, which is apparent in its four Visa credit card choices. The cards offer distinctly different perks — from rewards to a secured credit-builder option — that cater to different types of customers. Some banks choose to limit their credit offerings to only two cards — providing a low-rate pick and a rewards option — which is a strategy that, while it provides strong choices, can alienate customers who may not yet qualify for premium or top-tier cards. In contrast, Regions tiers its cards to appeal to a wider demographic, with options for a variety of credit types and spending habits. Moreover, the bank allows for customers to improve the card in their wallet along the way. 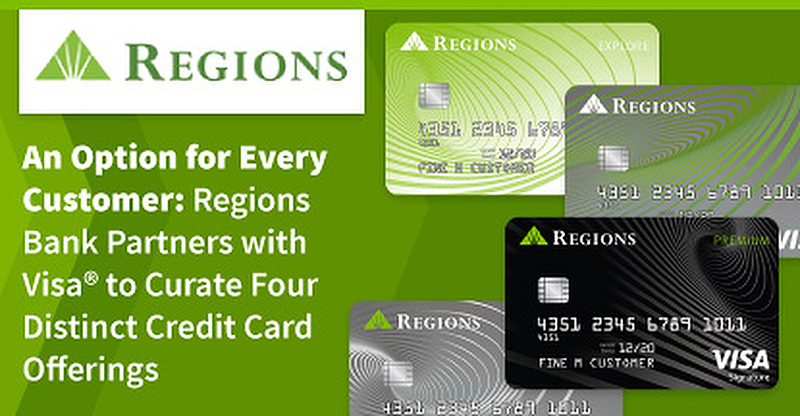 Regions’ top-shelf card provides 1.5X Relationship Rewards points on every dollar spent, a competitive rate that allows for unlimited earning. The card also has a generous 12-month, 0% introductory APR for new purchases and balance transfers. After the introductory period, the card’s revolving APR adjusts to a variable 13.74%, which is among the best in its class for a rewards card. The card does come with a $125 annual fee, but that can be offset initially with a bonus points offer that can be worth up to $300. The Premium card, which boasts credit limits up to $50,000, also comes with the Visa® concierge service, which is not available on any other Regions card. The service provides deals and booking services for anything from a night on the town to a month-long transcontinental getaway. While not as packed with perks as its Premium sibling, the Prestige Visa® Signature card offers many of the bells and whistles you’d get with the top-tier card — including purchase rewards — but without the annual fee. “The two cards are different in that the Premium Visa® earns 1.5 points for every dollar of spend, whereas Prestige is one point for every dollar spent,” Chadha said. The Prestige card comes equipped with the same 12-month, 0% introductory APR on new purchases and balance transfers as the Premium card. After the intro period, the regular APR ranges between 14.74% and 23.74%, depending on creditworthiness. Cardholders can also earn up to a $100 bonus by meeting a very achievable $500 spending requirement within the first 90 days of opening the account. The Regions Life Visa® card is a no-frills credit card that doesn’t offer rewards, but it does have an introductory 0% APR offer ideal for customers who tend to carry a balance from month to month or who want the convenience of a lower interest rate over rewards points. The card extends the 0% introductory rate to 15 months, with an ongoing variable APR of between 13.74% and 22.74% after that, while also offering no annual fee. The introductory offer applies to both new purchases and balance transfers (balance transfer fee applies). Cardholders who want to add a bit of flair to their wallet can customize their card, adding a picture of their choice by uploading a photo to the Regions YourPix Studio. The service is also available on the other Regions card options. The Regions Explore Visa® secured credit card is the bank’s newest offering, designed for customers who are working to build or repair their credit profile. Cardholders simply make a fully refundable security deposit and pay a $29 annual fee to open an account. The card’s credit limit is equal to the size of the deposit, meaning a larger deposit can unlock a larger credit line. The card features a 24.24% variable APR, as well as Visa® benefits like a warranty manager service, roadside dispatch, and a handy auto rental collision damage waiver. Chadha said the card has exceeded the bank’s expectations since its 2017 launch. No matter which Regions Bank credit card you carry, you’ll have access to the institution’s mobile application that features a range of online banking tools, as well as security tools like the popular Lockit control for both credit and debit cards. 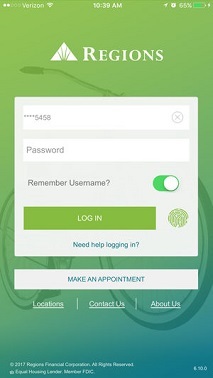 The Regions mobile app offers a ton of functionality, including advanced security features like LockIt. With LockIt, if you lose your card — or if you just want to keep the card dormant and not use it — you can use the app to simply turn the card on or off instantly with a single swipe. The functionality also allows cardholders to limit the card to specific types of transactions or to specified merchants. The goal is to give users greater control over their card’s security. Chadha said adoption of the app by Regions customers has improved steadily over time, which encourages the bank to continue to innovate its offerings. Regions understands that it has a responsibility to its customers if the company wants to remain a top US banking institution. The company strives to stay ahead of the marketplace with advanced technology offerings and products that save customers time and money. Because, after all, a customer who saves is a customer who returns. And Regions isn’t just about credit cards. The bank offers savings, checking, and loan products with interest rates that consistently compete with the largest chain institutions in the US. Chadha noted that those products will only continue to grow and improve as Regions expands its footprint.